Medicine Loaning Service, TXTMED Launched By RiteMed, LANDBANK, And FINTQ! Home / mobile service / news / txtmed / Medicine Loaning Service, TXTMED Launched By RiteMed, LANDBANK, And FINTQ! One of the largest challenges of life is dealing with a sudden emergency. It takes its toll on the body physically and may need medication but such medication comes at a cost. Sometimes the cost is above some Filipinos can afford. (From left) RiteMed Philippines, Inc. General Manager Vincent Patrick Guerrero, LANDBANK SVP Liduvino Geron, LANDBANK President and CEO Alex Buenaventura, LANDBANK EVP Julio Climaco Jr., and FINTQ by PLDT Managing Director Lito Villanueva lead the press launch of the Tamang Alaga TxTMED program at the LANDBANK Plaza in Manila. 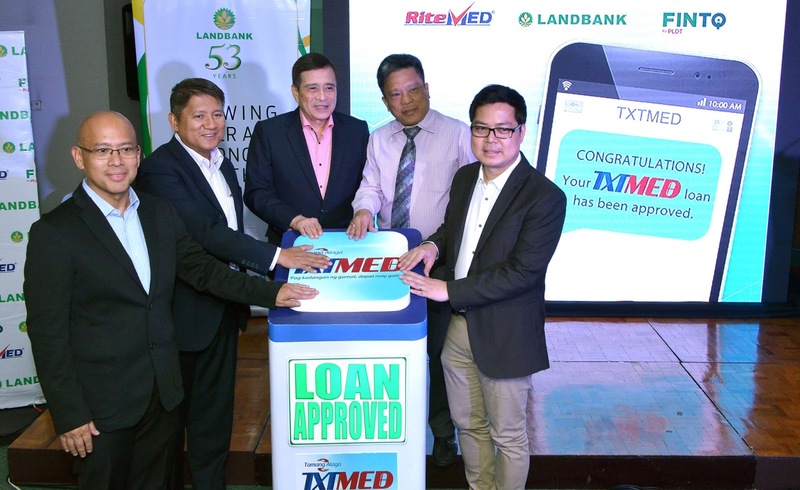 RiteMed, Landbank and FintQ have announced and launched TXTMed a RiteMed medicine loaning service that will be financed by Landbank, facilitated by FINTQ's IT. There are Three easy steps: 1. M- mobile application through SMS 2. E- electronic order via Landbank Mobile LoanSaver link and 3. D- delivery for free! “This partnership with RiteMed and FINTQ attests to the endless possibilities in terms of financial technology and the value of public-private sector collaboration, as we work towards optimizing digital transactions to improve access to quality healthcare across the country,” said LANDBANK President and CEO Alex V. Buenaventura. "RiteMed is committed to providing access to quality and affordable medicines for our fellow Filipinos. TxTMED is a collaboration of leaders in the healthcare, telecommunications, and finance industries that enable us to fulfill this mandate," says Vincent Patrick Guerrero, general manager of RiteMed. “Through technology and the strong backend support of a financial institution, our fellow Filipinos can now carry the burden of chronic illnesses who need to take medicines for life. According to a study by the Department of Health in 2016, households spend 50% on out-of-pocket healthcare expenses when a member of the family is sick," Guerrero adds. "This is another first in the world in providing access to healthcare through a digital lending channel. A high-impact initiative that promotes universal health care and social support access among Filipinos even at the grassroots, which is a basic human right,” said Lito Villanueva, Managing Director of FINTQ. "The power of digital lies in its ability to address gaps, and we're confident that the TxTMED service will help bridge access gaps for everyone's benefit," Villanueva stressed. RiteMed will offer a whole range of maintenance medicines at special prices through TxTMED, where medicines will also be delivered for free.